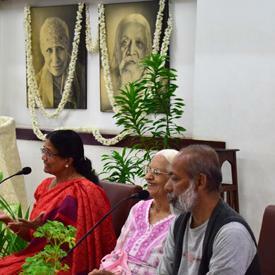 Our vision is to enable women to play their true role in all fields of life, and to help in the ushering in of the new race envisioned by Sri Aurobindo and the Mother. While great strides have been made in the matter of women’s empowerment in India as well as in several other countries, much more remains to be done. 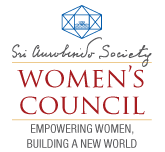 The Women’s Council strives to make a small contribution in this effort..
Our vision is to enable women to play their true role in all fields of life, and to help in the ushering in of the new race envisioned by Sri Aurobindo and the Mother. While great strides have been made in the matter of women’s empowerment in India as well as in several other countries, much more remains to be done. The Women’s Council strives to make a small contribution in this effort. 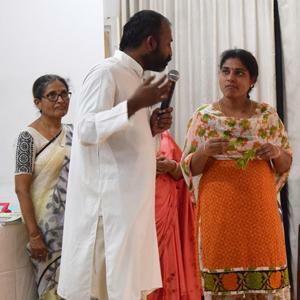 Awakening to the Beauty of the Future – a monthly bulletin in English, focusing on woman and her inner growth, in the light of Sri Aurobindo’s vision of the future, is published by the Council. Those participating in the Council’s work are encouraged to subscribe to this bulletin. A noteworthy feature of our work for women is that men are equally welcome to participate in all of the Council’s activities. For a full list of Publications and Products on Women, please visit the SAS online store at AuroService.